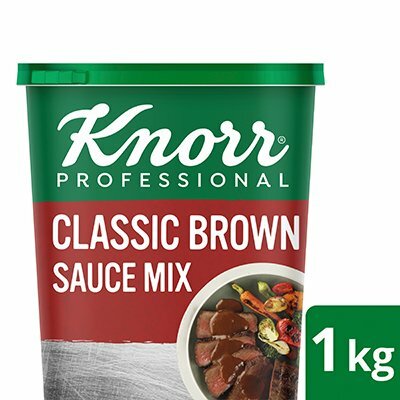 Knorr Classic Brown Sauce Mix is an authentic base for preparing different varieties of sauces including Mushroom, tarragon or black pepper sauce etc. just within 5 minutes. Contains celery, sulphite > 10 ppm, wheat gluten, soybeans and products thereof. • Add 100gm of Knorr Classic Brown Sauce Mix in 1 Litre of lukewarm water. • Whisk to break lumps. Bring the mixture to boil and simmer for 5 minutes, stirring occasionally. Ambient Storage (Store in a cool and dry place, away from direct sunlight). Cook demi glace brown sauce with roasted vegetables for a strong flavor.